When James Thompson started his job as Diageo CMO, he tallied the number of presentation slides he was exposed to in his first two months of meetings. The final count — more than 12,000. 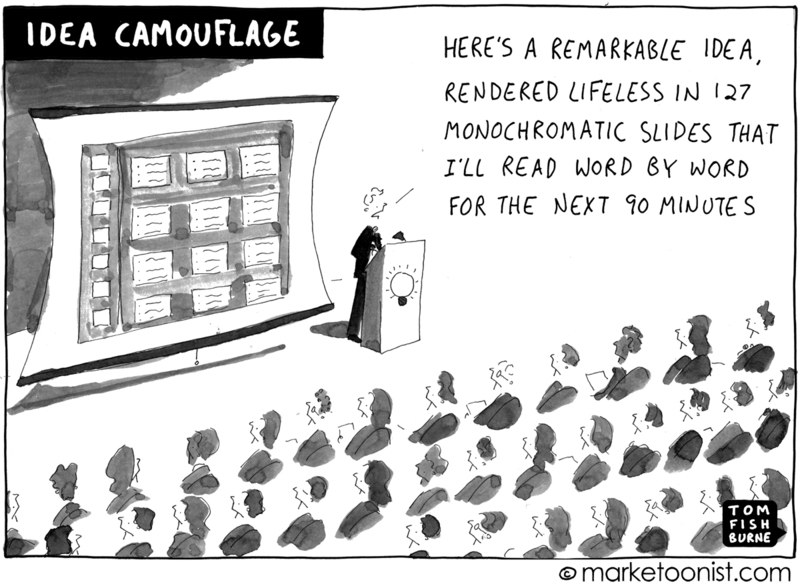 Marketers as a general rule suffer from PowerPoint-itis. We tend to use presentation slides as a crutch. As soon as we have a marketing idea, we rush to create a lengthy PowerPoint or Keynote or Prezi about it. Rarely do we have a meeting without a slide deck. As a result, business conversations turn into dueling sales pitches. Of course, PowerPoint-itis is not the fault of the tool. It’s how we habitually use presentation software in a way that gets in the way of communicating ideas. I once heard a talk by former BMW head of design, Chris Bangle. His entire presentation was composed of his own hand-drawn stick figures. He said he always communicated that way, because it was the only way he could be sure to be understood, from the board room to the factory floor. 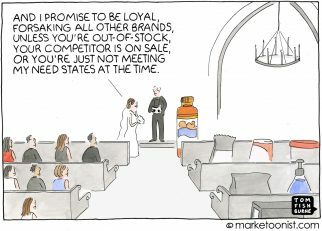 Last week I gave a talk to 200 marketers at a pharmaceutical company. 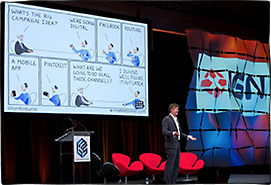 I talked about PowerPoint-itis as a barrier to building and sharing ideas in an organization. 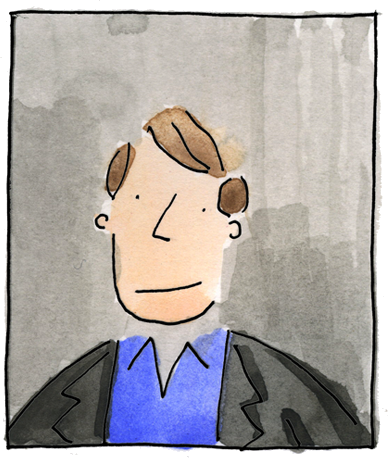 I then shared a simple, overlooked way of communicating ideas — the back-of-the-envelope sketch. First I asked everyone in the audience to individually draw a marketing idea as a doodle complete with stick figures. Second I asked them to exchange that drawing with someone around them. That second request caused a mild panic. The idea of sharing a sketchy, unpolished drawing with a colleague is fear-inducing. But that’s exactly the state and stage that ideas are best shared with colleagues — when they’re unformed and half-baked, not when they’re polished and perfect in a lengthy slide presentation. 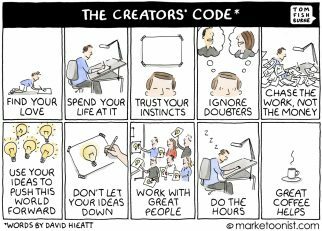 I think the fear of sharing ideas at this embryonic stage is part of what gets in the way of collaborating inside an organization. I asked everyone to build on their colleagues’ back-of-the-envelope sketches with more drawing and then return them. I don’t think that simple informal exchange of ideas happens enough in business. Marketers tend to focus too much on pitching and not enough on prototyping. What’s equally horrifying is the amount of resources applied solely to creating PowerPoint presentations. 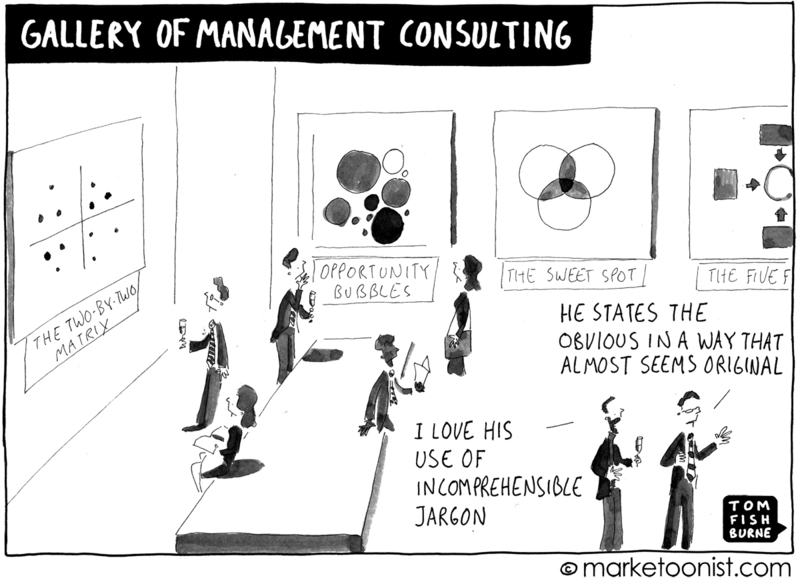 I once worked with a large financial services company where two floors of marketing staffers apparently did nothing but move elements around in PowerPoint slides all day. Great points Tom. There is a great book by Gar Reynolds called Presentation Zen that really gets to the heart of how to use ppt effectively as a tool. As other tools it can be used and overused. As a simple enhancement to the feeling I wish to convey with my vocal, without written words in the ppt, I like it. Like a title but not the article. That stands for meetings as a whole – talking to much about the wrong thing is always a waste of time. Maybe ppt is overused as a camouflage for just that? fantastic post this week. 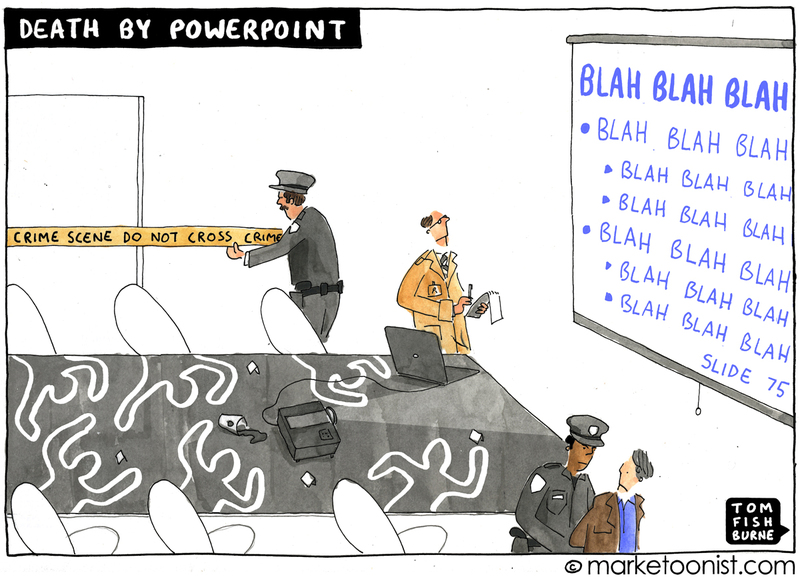 This is exactly how I feel about powerpoint and its use. Well done. Great discussion point as always . On one end, it’s about having the ability to communicate an idea/ vision/ etc., which is a skill in itself. On the other hand there are those – with whom the information must be shared – who need to “see the numbers” or a “key visual” – as many have lost (or never had) the ability to truly visualize a concept, see the potential, and expand on the discussion from there – but are wholly apt at critiquing a visual presented to them – even if they still don’t really understand the idea. PowerPoint is a useful tool, but ultimately, it’s also about finding the right way to engage and excite your audience, and for the recipient to be open to different ways of receiving information. p.s. 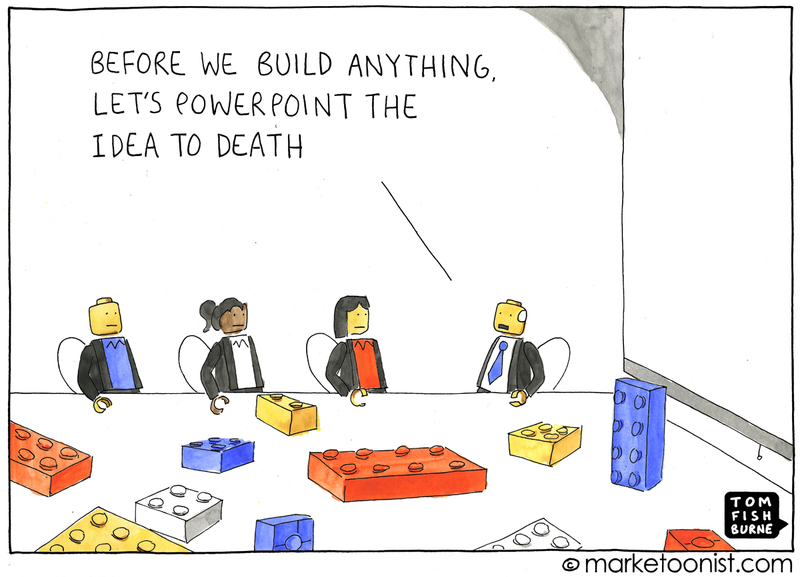 ‘Death by PowerPoint’ is an all-time favorite! 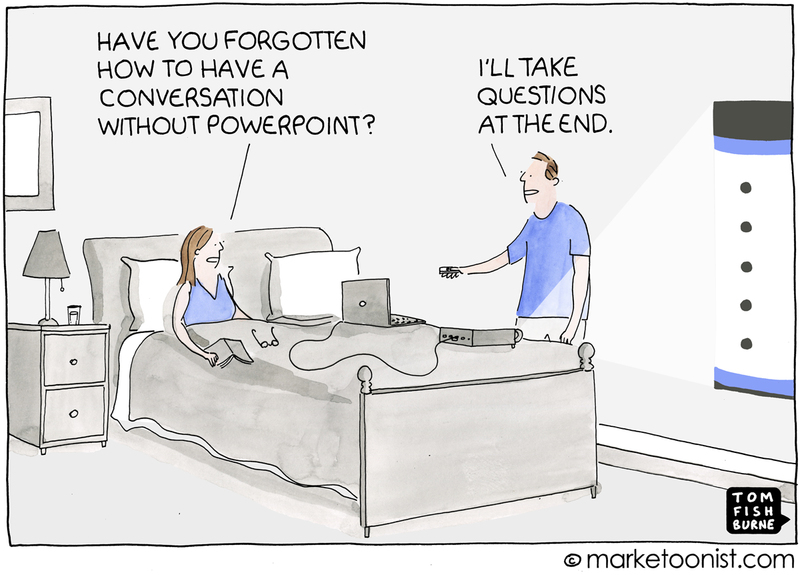 If you come to a meeting with PowerPoint it means you have no power, no point…. There is a great book about presenting in the right way to get messages across in different scenarios, to different audiences using the suitable tools. 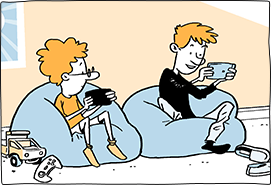 It’s called The Presentation Lab by Simon Morton, well worth a read. I completely agree with this article. The creativity of PowerPoint is a lost art. Its ability to engage has drastically decreased- nice wake-up call for those of us who frequently use it! Well done.